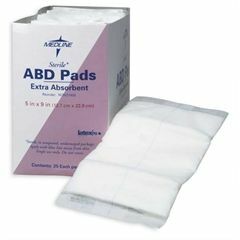 Curity Abdominal Pads 5 x 9"
Covidien Abdominal Pads 8 x 10"
Medline Abdominal ABD Pads - 5" x 9"
The Abdominal ABD Pads super absorbent abdominal pads feature a soft non-woven outer layer that quickly wicks fluid to a cellulose center. This thick layer of cellulose quickly absorbs and disperses fluids laterally to prevent pooling. Hydrophobic back impedes strike through and all edges are sealed to prevent linting. Sterile 5" x 9". Use to cover large foot ulcer. Good quality pads. high absorption. Due to circulation problems I am dealing with various ulcer-type wounds on both legs. The pads are essential in comfortably wrapping the wounds. Good padding for tailbone. Great coverage area. My daughter had an ulcer on her tailbone. Now that the wound has healed, we use this product to pad and protect the area. Medline abd pads Allegro ID: 564251 Are these latex free? The front of each pad shows a "latex free" label. I would like to purchase a case of the ABC pads. Would you send me a bill. It is important that I keep all medical expenses for tax purposes at the end of the year.